Everyone has their own conspiracy theory about who truly ended his life in Dallas fifty years ago today, but this isn’t the place to discuss that. Instead, I’ll be delving into the look and style of a man who became an American icon. JFK’s style and Brooks Brothers are intricately linked, with the Kennedy brothers popularizing Brooks Brothers suits during the early 1960s. Even before that, when Kennedy was married in September 1953, he had presented monogrammed Brooks Brothers umbrellas to his groomsmen. Kennedy even wore blue Brooks Brothers boxer shorts, as some have noted. 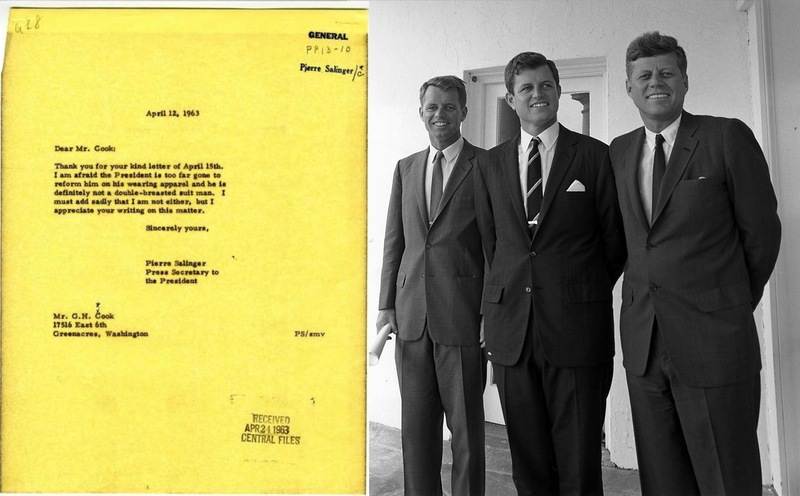 The mysterious Mr. Cook’s letter was doomed from the outset; all of the Kennedy men preferred single-breasted suits. 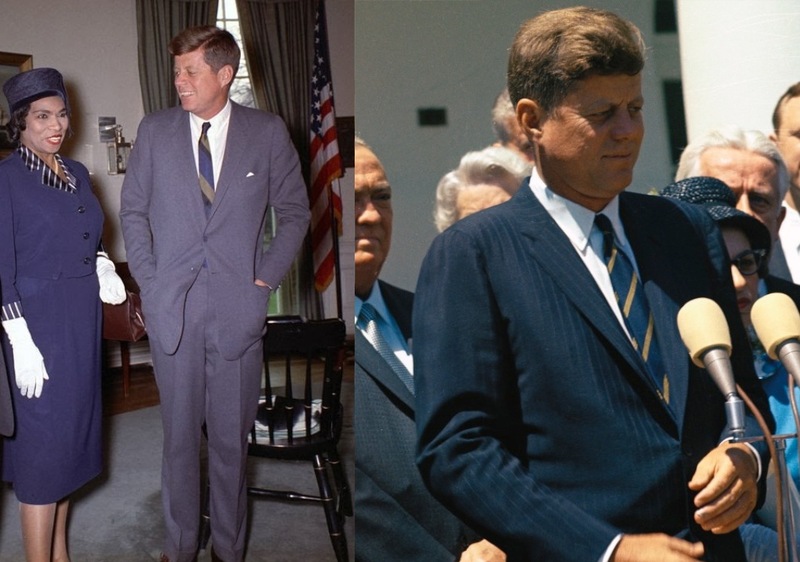 Most of Kennedy’s presidential suits were single-breasted with long slim notch lapels rolling to the first of two buttons. 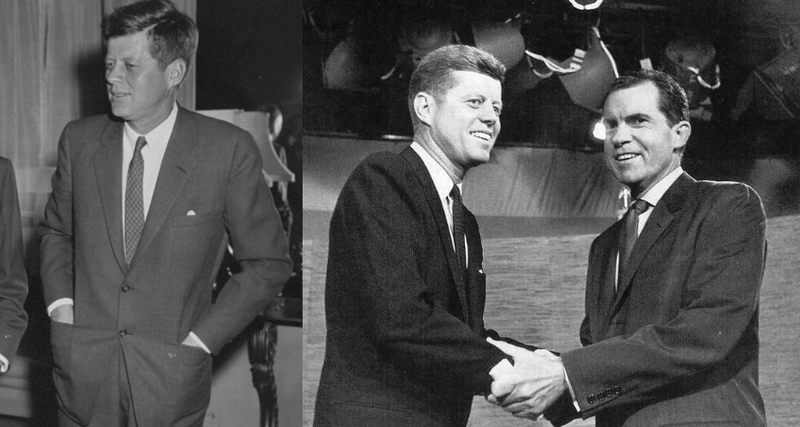 Although the general rule for 2-button jackets is to only fasten the first, Kennedy often wore both buttons closed. This could be considered a faux pas, but who would I be to judge the president? The suits were strong colors in solid shades of gray and blue, with either plain patterns or a subtle pinstripe. From all color photos and videos I’ve seen, he never wore a suit in any color other than gray or blue during his term of office. Blue suits are said to convey confidence and power as well as accentuating youth. Since Kennedy was the youngest president in sixty years, it would certainly inspire confidence for the nation to see a young, powerful man at the helm. Charcoal gray is said to project authority and professionalism, a wise choice for a commander-in-chief. Furthermore, charcoal gray is very versatile and can be worn with a variety of shirts, ties, and accent pieces. Evidently, the press loved getting photos of President and Mrs. Kennedy on stairs. Here, Kennedy wears oxblood shoes and a red tie with both a solid gray suit and a dark blue pinstripe suit. The suit jackets were ventless with slim-flapped or jetted hip pockets. Everything about the look was slim and sleek. The fit was a modified Ivy style with small, soft shoulders, a shallow chest, and very little waist suppression. Some of the smaller details – such as whether or not the jackets had 2, 3, or 4-button cuffs – varied, but the general look of his suit remained the same. 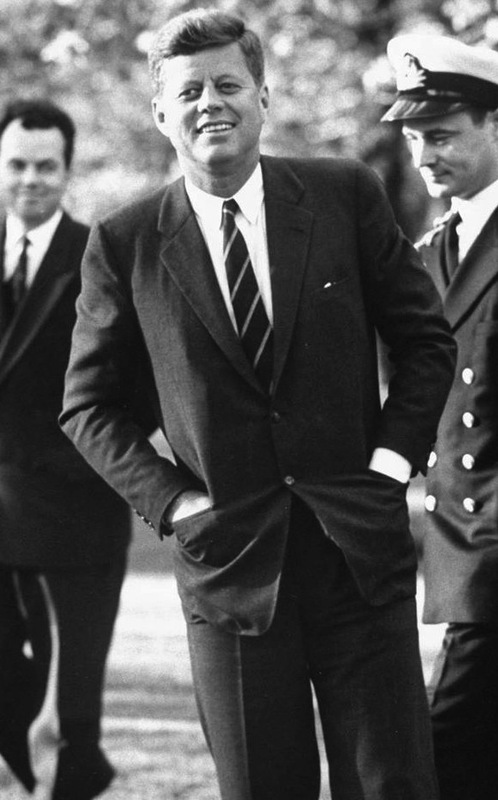 Kennedy’s suit jackets in 1960: all cleanly cut with single-breasted 2-button fronts, notch lapels, breast pockets, and jetted hip pockets. Kennedy often topped off his look with a neatly folded white handkerchief in his welted breast pocket, fixed neatly so that just the tip of the handkerchief’s folded point would show above the pocket line. It was typically very subtle, merely a white speck against the gray or blue of the breast of his suit. From this rare color photo of the famous 1960 debate, we are able to see Kennedy’s cool, confident look with the white handkerchief just peeking out from his breast pocket. Nixon, on the other hand, just looks like Nixon. Kennedy’s suit trousers were always flat front with slim legs that wore down to cuffed bottoms, draping with a medium-to-full break over his shoes. 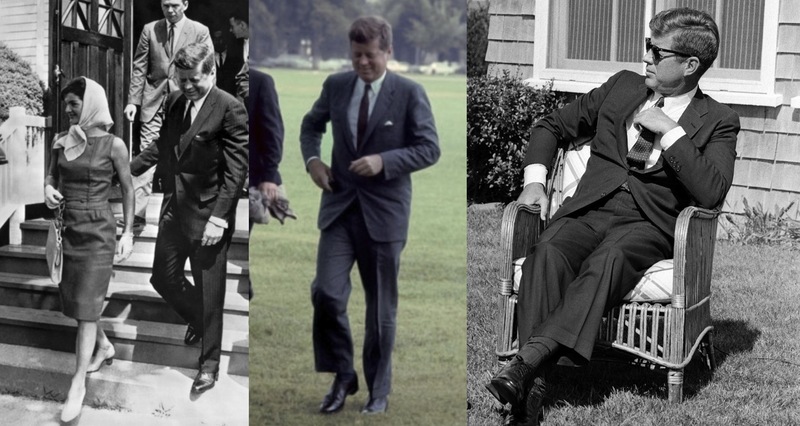 His trousers were occasionally plain-hemmed, but cuffed bottoms were Kennedy’s typical look. Most were worn with a black leather belt, fastened in the front with a squared steel single-prong buckle. The belt was rarely seen, since Kennedy almost always had his jacket closed, but in a few candid photographs, the belt can be spotted. Kennedy’s trousers also typically had shorter breaks, especially as his presidency progressed. Luckily, he wore suit-matching socks to continue his leg line into the shoes. To single out one suit in particular, the suit worn by Kennedy when he was in Dallas 50 years ago today was a charcoal plain weave pinhead pick suit, naturally single-breasted with slim notch lapels rolling to a 2-button front, which he wore with both buttons fastened upon stepping off of the plane. The suit had a ventless rear, 4-button cuffs, jetted hip pockets, and a welted breast pocket, with the ever-present tri-folded white handkerchief poking up. The Dallas suit trousers also had cuffed bottoms. The President and Mrs. Kennedy in Dallas, November 22, 1963. 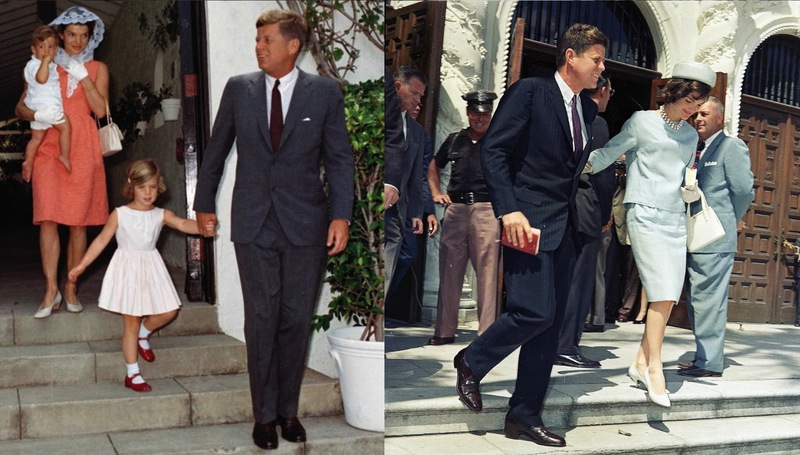 The shirts Kennedy wore with his suits varied in colors and styles, but the most typical look was a white shirt with short point collars and French cuffs. Occasionally, he would wear shirts with stripes or barrel cuffs, but he was almost always seen in public with a clean white shirt. 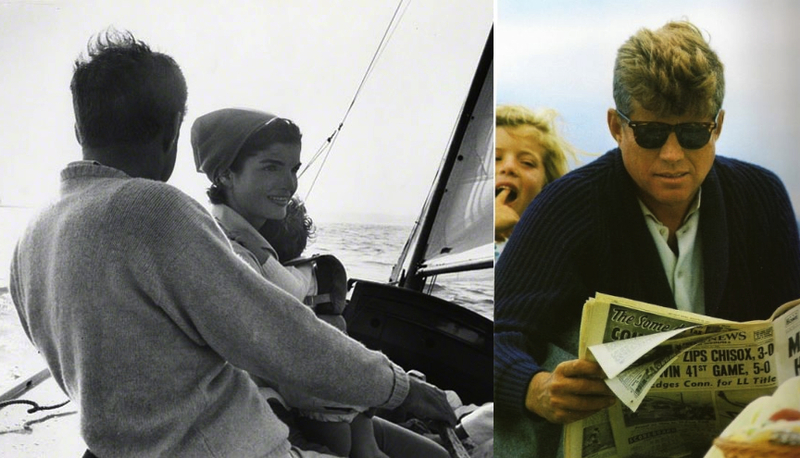 Some shirts, including one seen in a LIFE shoot on the campaign trail with Kennedy in 1960, were even monogrammed with “JFK” on the left breast. Kennedy in a posed moment in the Oval Office and a more candid moment while campaigning a few years earlier. 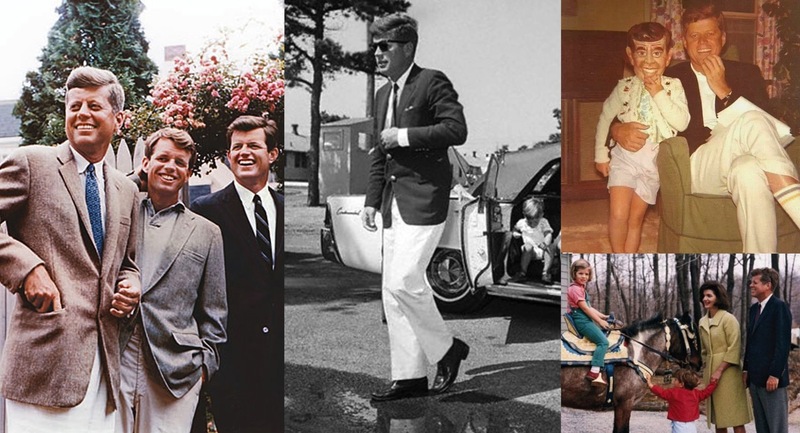 The shirts, though they differ in color, carry the JFK trademarks of French cuffs, slim spread collar, and monogram. On the day he was assassinated in Dallas, Kennedy was wearing a white striped Brooks Brothers shirt with white buttons down a front placket. In a nod to patriotism, the shirt had alternating sets of thin triple stripes in dark navy and rust red. Anyone curious can check this link, as I didn’t want to include the more morbid images on the blog. Being the President obviously means a certain number of perks. 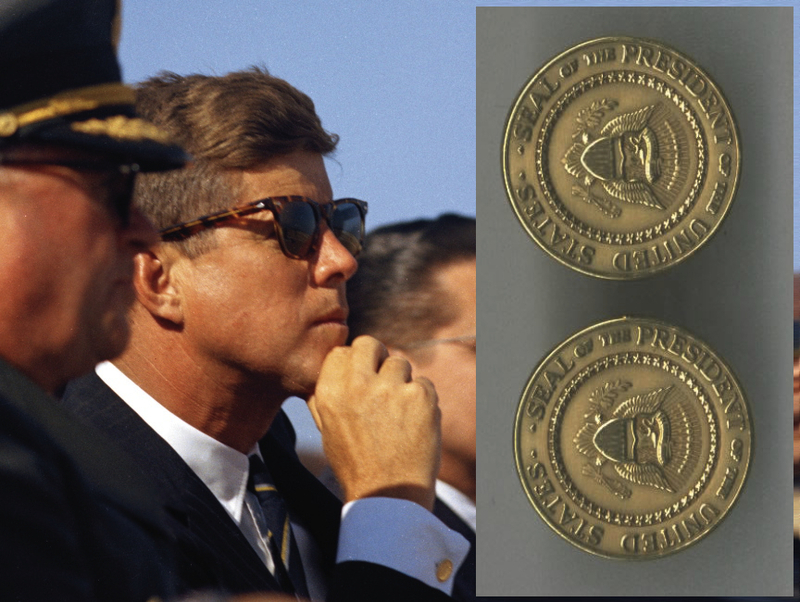 For Kennedy, one of these perks included a set of beautiful 14K solid yellow gold cufflinks with a die struck Presidential Seal on the front and Kennedy’s engraved signature on the rear. He frequently wore the cuff links and would give them as gifts to close friends and visiting Heads of State. Sets that have survived to this say have sold for around $10,000 each. 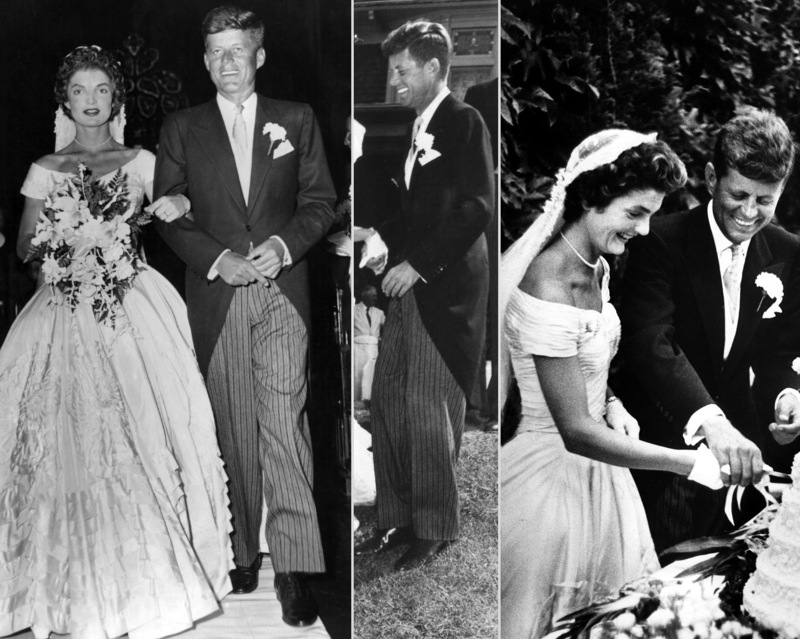 For an added touch of luxury, Kennedy wore primarily silk neckties with varying patterns ranging from solids to stripes and geometric prints. 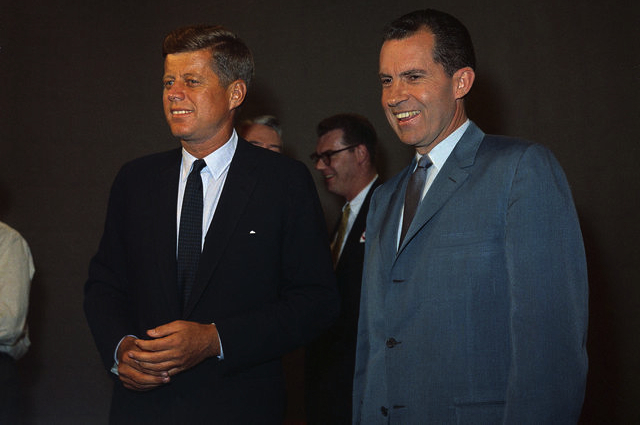 Blue was a prominent color in his ties, with Kennedy wearing all shades of blue from a light blue pick pattern to dark blue grounds on striped ties. The Christian Dior tie he was wearing at the time of his death in Dallas had a very dark blue ground with a blue and green floral pattern repeating throughout. 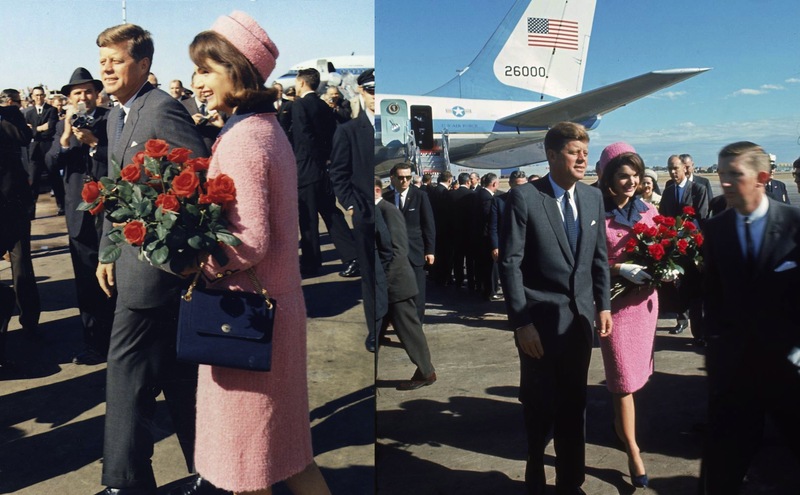 Jack and Jackie at Dallas Love Field. 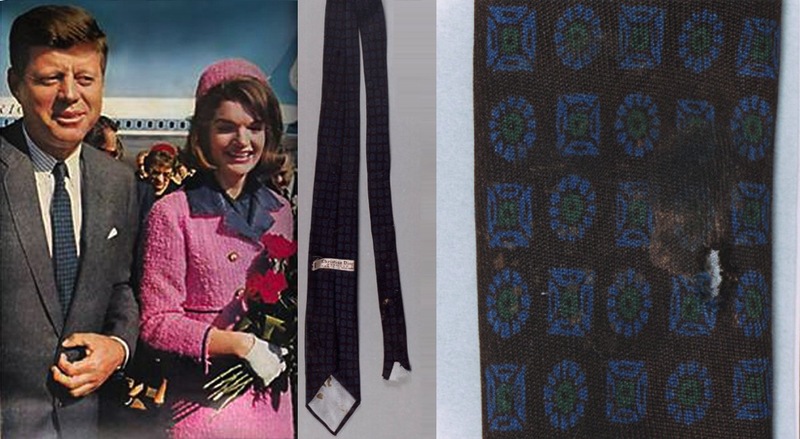 Kennedy’s Christian Dior tie had a dark blue ground with a green and blue floral pattern. Interestingly, Kennedy’s striped ties have stripes in both the American (right-down-to-left) and British (left-down-to-right) directions. Tie stripe directions can be traced back to the 1920s when Brooks Brothers (of course) first brought the regimental tie to the United States. Fearing that the Brits would be upset to see an American businessman wearing the striped tie of a respected old English school, Brooks Brothers wisely reversed the direction of the stripes and the American right-hand-high striped necktie was born. Kennedy wears his American-striped ties with a solid gray suit and a British directional striped tie with his blue tonal pinstripe suit. Note that, as usual, he has both buttons of his gray suit fastened. Kennedy’s American-striped ties all had blue prominently, usually with a blue ground and stripes in olive and black, thin gold, or deep charcoal. His ties with the British regimental stripe also had dark blue grounds with stripes in dark red, tan and yellow, or a lighter shade of blue. Kennedy wears ties with the British directional stripe. Note that these are not the traditional regimental tie, as that would be too British-looking. Also note Kennedy’s pal Sinatra with him, during the filming of Ocean’s Eleven. The suit Sinatra is wearing can be found elsewhere on this blog. While his ties often rotated, JFK was always seen in public wearing a pair of well-shined black or oxblood laced Oxfords and dark socks, usually matching the color of his suit to continue the leg line without interruption. In cooler weather, although Kennedy was well-known for forgoing hats, he would don a plain dark gray knee-length Chesterfield overcoat with notch lapels and a 3-button front hidden under a covered fly. Additional overcoat details include hip pockets and 3-button cuffs. In the brief period of the year that D.C. is actually chilly, Kennedy’s overcoat would have come in handy. 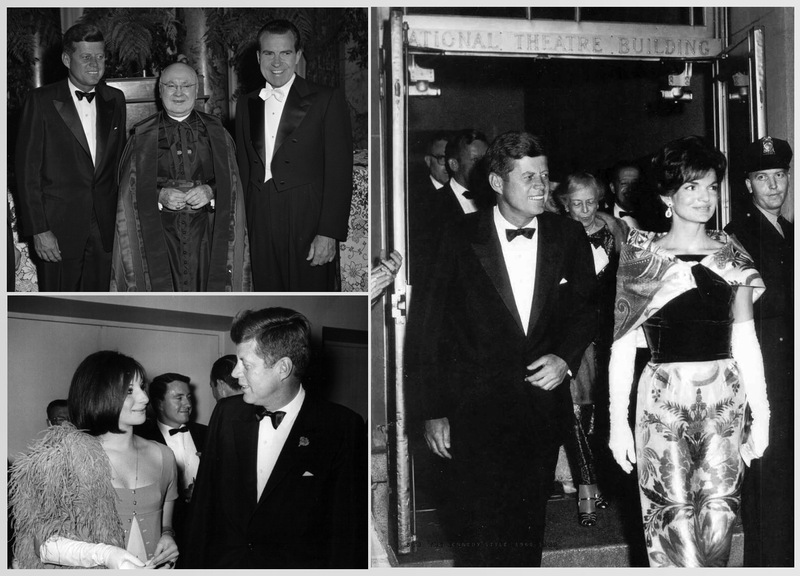 Kennedy followed the conventions for formal dress, often making a few new rules for himself along the way. For both his wedding and his inauguration, he wore morning dress, consisting of a black 1-button cutaway morning coat, a gray waistcoat, and hickory-striped trousers with plain-hemmed bottoms. 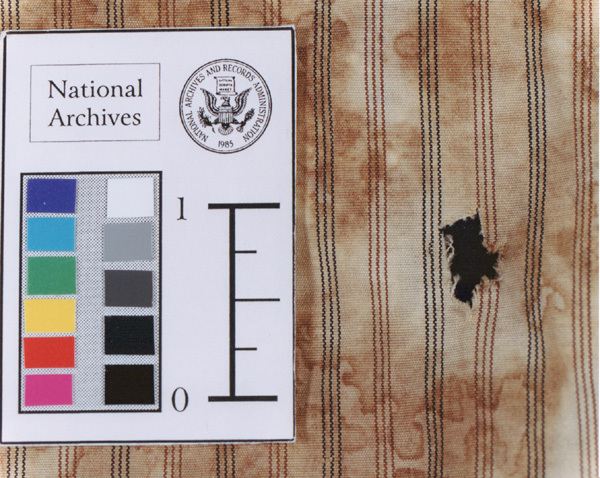 JFK wore his morning dress with a white turndown collar shirt and a patterned necktie. His shoes were his usual well-shined black leather plain-toe Oxfords. JFK wore a white handkerchief in his breast pocket and a white boutonnière on his left lapel for his wedding, but his breast pocket and lapel remained empty and clear for the more somber inauguration seven years later. Kennedy celebrated his wedding in traditional morning dress, with a boutonnière and white handkerchief embellishing the look. Although he had French cuffs for his wedding, he strangely wore a shirt with buttoned cuffs for his inauguration. Both the black cutaway coat and the gray waistcoat underneath had peak lapels. The cutaway coat also had 4-button cuffs and slightly padded shoulders. The wedding waistcoat was double-breasted, but the waistcoat for his inauguration was a higher-fastening single-breasted vest. For his inauguration, Kennedy completed the look with his Chesterfield overcoat and a black silk top hat, marking one of the few public occasions where he indeed wore a hat. Eight years after his wedding, Kennedy was again in morning dress to take the oath of office. As part of the Sinatra set, Kennedy naturally knew how to wear a tuxedo and always dressed to impress at black tie dinners. When it came to black tie, JFK would often sport a black dinner jacket with sleek satin-faced peak lapels and a single satin-covered button closed in the front. His jackets had jetted hip pockets and a welted breast pocket, where the edge of a white folded handkerchief would often be accompanied by a small flower on his left lapel. Underneath, he would wear a white shirt with French cuffs and white buttons down a front placket. Although the era was leaning toward straight-edged bow ties, Kennedy’s black satin bow ties were more often in the more traditional butterfly-edged style. Like his pal Sinatra, Kennedy knew how to wore a tux. He wore it with celebrities (Barbra Streisand, lower left) or even an inappropriately white tie-clad Nixon (upper left). Some Presidents have done white tie correctly where others have failed miserably. Kennedy hit the seven points necessary for perfect white tie, as determined by the Black Tie Guide. He wore a black wool evening tailcoat with a double-breasted 6-button front. As usual with evening tailcoats, the buttons are ceremonial rather than functional and do not fasten. The peak lapels are faced with satin, with the fronts of the coat ending just below his waist. Kennedy keeps his jackets consistent with the point of his white handkerchief emerging over the top of his welted breast pocket. On some occasions, he wore a small purple flower fastened through his left lapel. The plain-bottomed trousers are black to match the tailcoat with single pleats in the front and a high rise, likely cut for suspenders. The four buttons on each cuff are, like the buttons on the front, covered in the same black satin used to face the lapels. 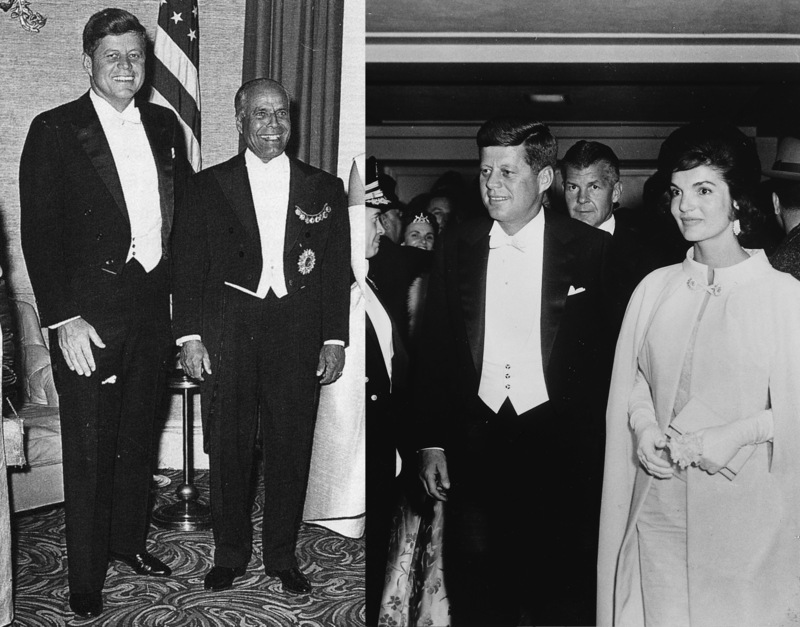 Whether with his lovely wife or a visiting dignitary, Kennedy always dressed to impress when wearing white tie. The white shirt has a stiff bib and wing collar, under which Kennedy wore a white piqué self-tied butterfly-shaped bow tie. The shirt also has single cuffs, fastened by a set of dark metal cuff links. The white piqué waistcoat is low-cut and single-breasted with three dark exchangable buttons and oblong self-faced lapels. There are welted hip pockets and a notched bottom that doesn’t expand past the bottom of the front of the tailcoat. A mistake made by many men with white tie is to wear a coat too short for the waistcoat. Kennedy wears black leather plain-toe oxfords, as usual, with black dress socks. He rounds out his accessories with his Omega wristwatch. Some have argued that white tie can only be worn with a pocketwatch, but dressy watches have been gaining more acceptance. This especially makes sense given Kennedy’s reputation as a trailblazer of presidential style. When not stretching out behind the desk in the Oval Office, Kennedy defined the Ivy League casual style of the early ’60s. On land, this often meant blazers in navy blue wool or brown Harris tweed, paired with khakis in the summer or gray flannel trousers in the cooler months. The sport jackets were often cut like his suits with slim notch lapels, 2-button fronts, welted breast pockets, jetted hip pockets, and 4-button cuffs. Underneath, the shirts and ties were the same as his suits – white shirts with blue-ish ties. Kennedy sports seasonal casual when with his family. (Left) – A tweed sport coat when sharing a laugh with his brothers. (Center) – White trousers while on the campaign trail with his kids bundled into a sharp Lincoln Continental. (Upper Right) – Caroline dons a mask of her father around Halloween. (Lower Right) – A navy blazer and flannels for a winter outing with Jackie and the kids. However, Kennedy was rarely on land in his free time. He would often be found his personal sailboat, the 26-foot-long Victura he had received as a gift from his father when he was 15. His on-board uniform was usually a polo, sweater, and boat shoes with either slacks or shorts. 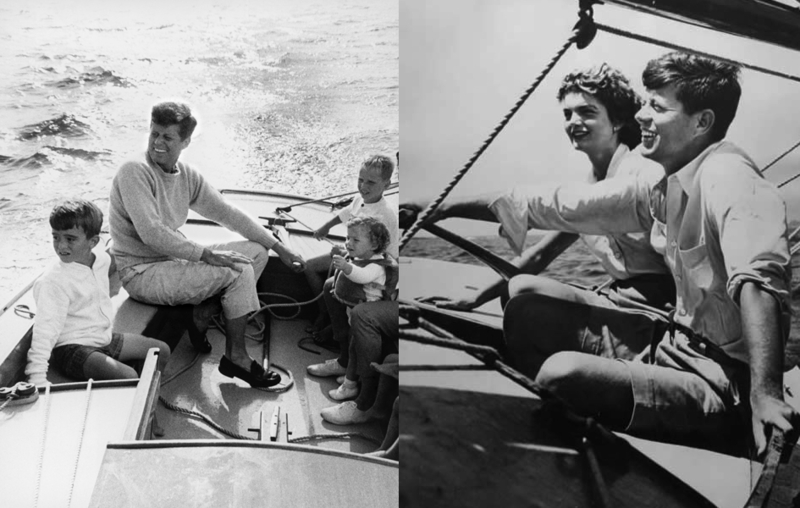 The polo shirts were pima cotton, a very soft, comfortable, and durable fabric that is a good choice for JFK’s nautical adventures. He was often seen in several colors including white, deep blue, and gray. Kennedy embraced warm days in the sun with a short-sleeve blue polo. Of course, on cooler days he would wear a long-sleeve polo but still opt for an ice cream cone. 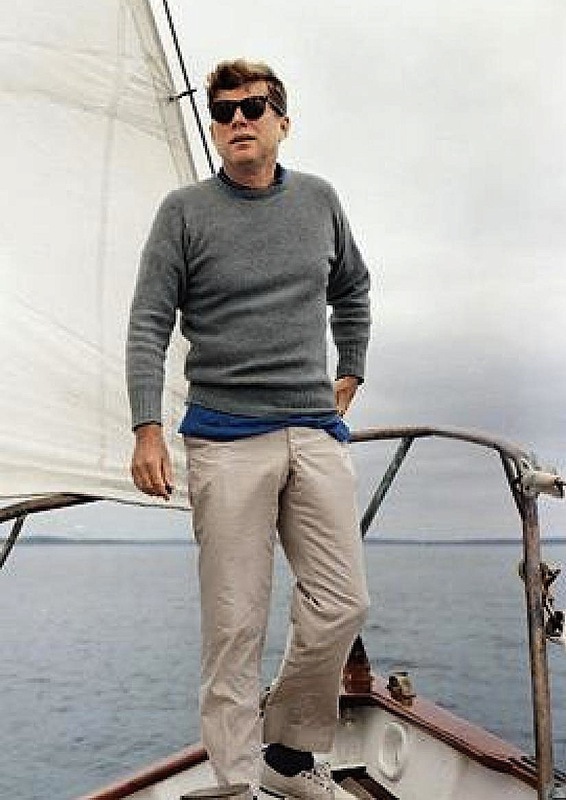 As it could get very cool on board, Kennedy wisely slipped sweaters over his polos such as a navy long-sleeve bulky knit cardigan with shawl lapels or a light gray crew neck sweater in either cashmere or Shetland wool. For especially cold days on board, he would sport a dark brown leather bomber jacket like the G-1 flight jacket with fur collar. This makes sense given Kennedy’s past career as a Naval officer since the G-1 was the WWII-era flight jacket for the Navy, Marines, and Coast Guard whereas the Army and the Army Air Corps preferred the A-2 jacket. 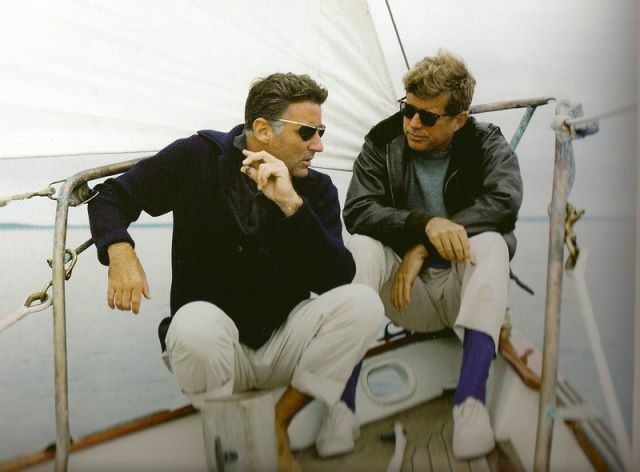 Kennedy wears a bomber jacket while entertaining none other than Rat Packer (and brother-in-law) Peter Lawford on his yacht. Kennedy’s pants were invariably white or light khaki slim cut flat front trousers in heavy Sea Island cotton with plain-hemmed bottoms. With his colored polos in the summer, he would spring for light khaki shorts. On his boat, Kennedy would smartly not wear the black oxfords he wore with his suits and formal attire. His shoes were typically off-white canvas sneakers with white laces, worn with thin socks in either white, blue, or black. On sockless days, he would wear dark leather penny loafers that was usually paired with a sweater and white boat slacks. Around his various vacation homes, he would wear velvet Albert slippers with his initials in gold. 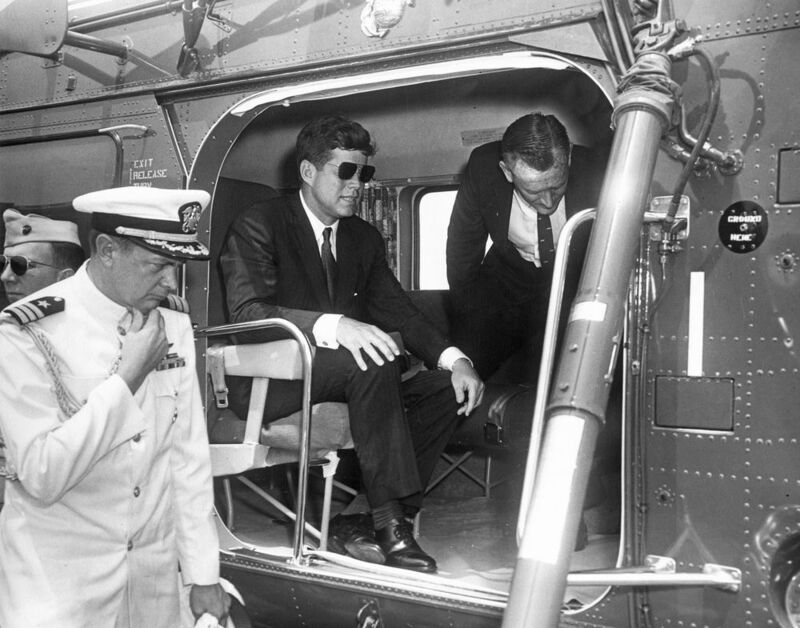 Kennedy was almost always seen out with a pair of tortoiseshell sunglasses. 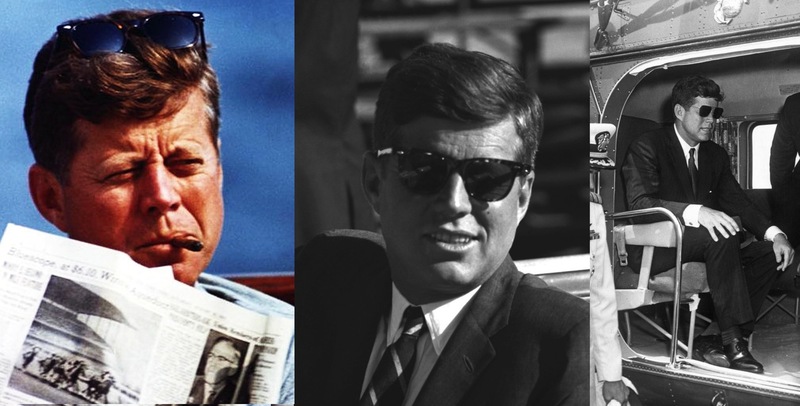 Many have identified these as classic Ray-Ban Wayfarers, but Providence Optical did some extensive research and identified three different pairs of Kennedy glasses: American Optical TC74-51, Cabana TS 2505, and Univesal Optical “Mansfield Square” glasses. He also wore military-style aviators when in military settings, such as his commencement address at the U.S. Naval Academy in June 1961. The Omega “Ultra Thin” watch of U.S. President John F. Kennedy, called the “Stockdale watch”, 18 carat gold frame with the engraving “President of the United States John F. Kennedy from his friend Grant”, which was worn by John F. Kennedy during his inaugural address in January of 1961. The watch now belongs to the Omega Museum at the company’s headquarters in Biel, Switzerland. No matter what the rest of his attire was, JFK almost always kept time on his Omega. The stylish Kennedys were a contrast to the previous families in the White House, bringing youth and freshness into the executive branch. Kennedy’s (and his wife’s) cocktail of choice was a daiquiri, although he was also reportedly quite a beer drinker as well. I don’t believe he smoked cigarettes, but he was a cigar aficionado and his last cigar, a Perfecto Garcia Ensign, was removed from his office the day after his assassination by his secretary, Evelyn Lincoln. The Ensign measures 6.5″ x 43 and can be purchased online for $3.45 a smoke. 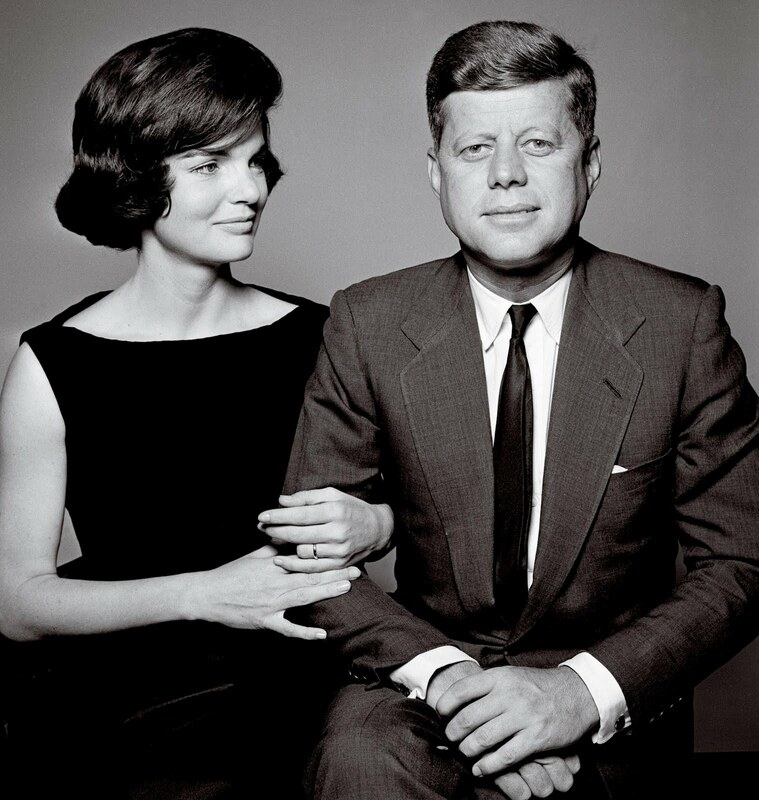 Despite any trouble behind closed doors, the Kennedys radiated class when in the public eye. This portrait by Richard Avedon, taken at the Kennedy home in Palm Beach weeks before the family moved into the White House, is from a legendary session that shows just how different this family would be from previous administrations. According to the John F. Kennedy Presidential Library and Museum, JFK wasn’t a very big eater but he would appreciate a hearty, sophisticated meal when he had the time. Breakfast was typically poached eggs on toast (with the eggs cooked for 4.5 minutes), crisp broiled bacon, and toast with jam, with milk, orange juice, and coffee with cream and sugar. Come lunchtime, Kennedy enjoyed soup, cold beef or grilled cheese sandwiches, and fruit, with New England Fish Chowder being a favorite as well. This should come as no surprise, as Kennedy was a proud Bostonian. However, White House executive chef Rene Verdon also reported that Kennedy enjoyed a “tiny” quiche for lunch. More on Verdon later. Dinner varied, with lamb chops, steak, baked chicken, white turkey, seafood, baked beans, and mashed potatoes often showing up on the menu. A favorite chicken dish was chicken with terragon, also known as Poulet a l’Estagon for all you French speakers. JFK also enjoyed corn muffins, the favorite of former president (and decidedly less hedonistic) Calvin Coolidge. Dessert wasn’t common, but it was typically chocolate-based. When venturing out, Kenendy supposedly would order a bowl of vichysoisse and chicken in champagne sauce from New York restaurants, such as La Caravelle. In her article “Food News: Done to the Tastes of the Presidents” in the New York Times just after Kennedy took office in January 1961, June Owen reported that JFK would ask La Caravelle’s chef Fred Decre to prepare two of that dish for his airplane trips. For more information on food of the Kennedy White House, check out Food Timeline’s incredibly interesting and definitive page about it. You’ll also learn plenty about Jackie’s entertaining style and the cuisine trend at the time (hint: It was mostly French, thanks to Julia Child.) Supposedly, Jackie had even lured French expert Rene Verdon from the Carlyle Hotel in New York to the White House kitchen to inject his French flavor into state dinners. 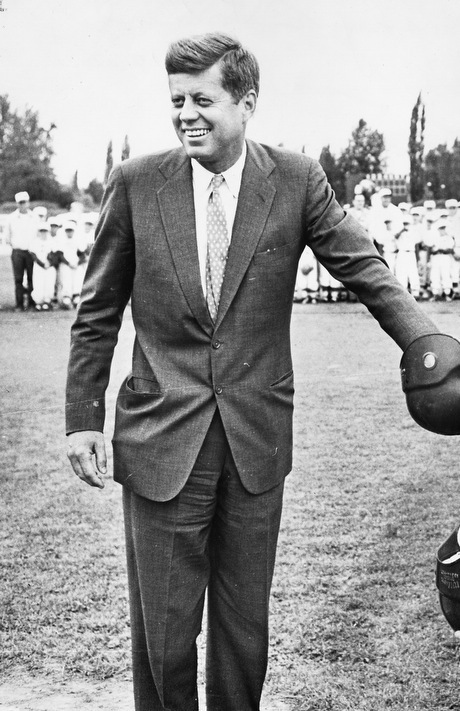 Kennedy opens a Little League game in Portland while campaigning in 1960. Kennedy was known for nailing down two primary looks: his Brooks Brothers business suit and his New England boating attire. Become your own master of both and you may have a shot at the presidency some day. Gold round cufflinks… If you’re President, you probably have a nice pair with the Presidential Seal on them. For true Kennedy style, stand on the bow of a grand yacht in the waters off of New England. Read Kennedy’s book, Profiles in Courage. Photo of “no-breastpocket blue suit” is mirrored. Look at suit fastening – it’s reversed, woman-style, not man-style. So, there is a breast pocket, unseen behind the microphone. Thanks, Roman! Not sure how I didn’t even think to look for that; I had just seen the picture a few times and accepted it as gold. The crazy thing too is that I was using that photo to indicate the direction of the stripes on his tie. Having reversed it back to its original look, it naturally changes the tie stripe’s directions as well. I owe you a round for noticing that before I looked too foolish! By the time Kennedy was president I doubt many of the suits he wore came from Brooks Brothers. He was wearing better, custom-made suits. Many of Kennedy’s suits were made for him at Chipp by Sidney Winston. He was also known to have used the Savile Row tailor H. Harris. Thanks for this information! Brooks Brothers certainly plays up their association with Kennedy, but it makes sense that – especially when he was President – he would have custom suits made for him at these shops. I’ll research more on my own and integrate what I find accordingly. the tweed sport coat shown with Kennedy sharing a laugh is definitely a Chipp. I have the same exact jacket up in the closet once owned by my father-in-law. December 2, 2013 - 3:58 am WM. Terrific article! Not sure if I would describe the suit trousers as having a medium-to-full break though. Slight-to-medium seems more accurate based on the pictures. I’m really digging those white trousers worn with the blazer. Very cool and casual. Matt’s right. I must also point out that many of his jackets, both suit or sport, were actually designed to have both buttoned. The stance is raised slightly from the norm in the ’50s and ’60s and there is no cutaway below the top button. I also know that JFK, brother and father had suits made by John Morgan & Co. Tailors from Hanover Square London W1. I have seen the original patterns with their names on them and fabric swatches- very cool. (they have been locked up for years but recently the company was bought and are just now seeing the light of day). (1) What kind of tie knot to JFK use? (2) He’s often seen with his hands in his suit pockets…any idea why? Idiosyncratic custom? I had heard he usually had a cigar in there. I also read in a book that he often put his hand in his suit pocket with his thumb out over the seam, but every picture I’ve seen he has the hands (or hand) fully in the pocket. Looks like a four-in-hand to me. Maybe I don’t get it but the majority of his suit jackets look poorly cut and certainly not “ivy” style. His bad habit of buttoning both suit buttons make the jackets look even worse fitting. Added to this, as already mentioned; another habit of placing both hands in his pockets is very odd. To sum up I consider he presented himself badly in his suits which must have cost alot. Strange Jackie never advised him to present himself better. However, he was pretty cool in casual wear. Thank you for researching and writing such a comprehensive treatment. Kennedy typically wore tailored suits made by Chipp, which one can see advertised in The New Yorker at that time. Never been able to figure out buttoning the second button on the suit coats. Coming from as much money as they had, and the number of handlers you have as president, it must have been a conscience decision. As you point out, a faux paus nonetheless. Interesting article, classic old money style/clothing. The Paddock model jacket is a bespoke jacket design, rarely seen but legitimate nonetheless, designed to have both buttons buttoned. This is accomplished by having the buttons a bit higher than the typical two-button jacket. Kennedy seems to have favored this design from his youth; there are more pictures of him wearing such jackets at this link. So no, it is not a faux pas. He was a cigarette smoker, Kennedy. You can find a photo of him on Google Images leaning across at a dinner party to let Frank Sinatra light his cigarette. In the photo of JFK, Nixon, and Francis Cardinal Spellman. This was taken at the Al Smith Dinner. It is a White Tie affair. JFK is the one dress inappropriately. What sharp and fashionable dresser no matter the occasion. So graceful and stylish @JFK..
JFK had sever chronic back pain, and often had to wear a back brace. I would bet his interest in concealing the brace explains both suit buttons being fastened. Excellent post, as always. My late husband would always tie his ties with the Kennedy knot. He would always share the ‘how to’ with anyone who asked. I would love to pass this on to my Matt, my brother-in-law. Where can I find instructions? Military knot, a.k.a., four-in-hand knot.